Like, completely, overwhelmingly, not-gonna-stop-unless-you-make-me-and-even-then-it’s-iffy. 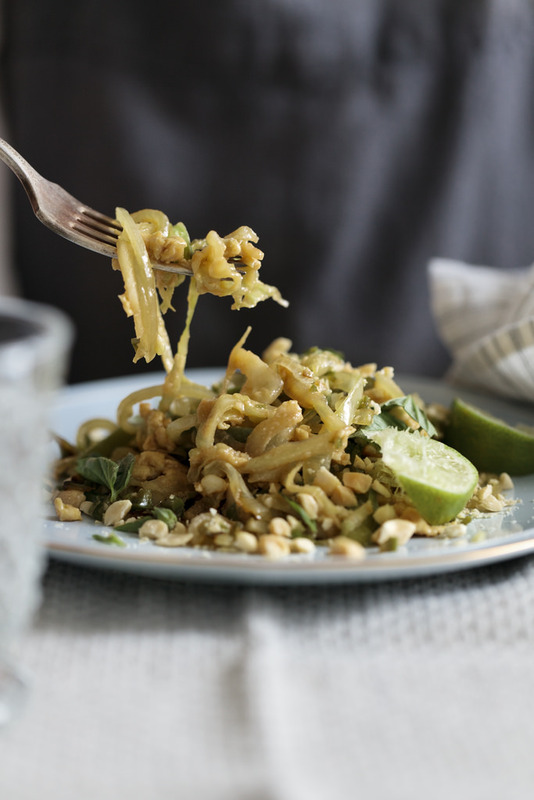 I’ve been making this lightened up (and low carb) pad thai for…oh, I don’t know…ten days? I’m using shredded cabbage as noodles in the recipe, which really does mimic the slippery, carb-like texture of the noodles. They still absorb the flavors of soy and sesame, and even give the dish a nice freshness, too, and who wouldn’t love that? For 300-ish calories, this portion is so big and filling; you’ll be shocked and so, so happy. **Note that this recipe isn’t authentic. It’s simply a quick, easy meal to throw together that tastes a bit like pad Thai, with thin strands of cabbage serving as the noodles. It’s so delicious I’d call it blissful. Delicious and healthy pad Thai made with cabbage noodles! In a small bowl, stir together the soy sauce, garlic, and sugar. Set a large frying pan or wok over medium-high heat. Add the oil and swirl to coat. Add the cabbage and cook, stirring frequently, until tender-crisp, 6 to 8 minutes. Add the mushrooms and cook until softened, about 3 minutes. Add the soy sauce mixture and stir well to combine. Add eggs and stir constantly, scrambling them into the hot cabbage mixture. Stir in the cilantro. Divide the pan among two large plates or bowls and top with the peanuts and plenty of Sriracha. I never thought to substitute cabbage…this is definitely going in the recipe bucket to try! Love pad thai – I used to get takeout in college every time I was studying for a big exam. This was my go to comfort meal! This version sounds great – yum! I didn’t even read the post. Pinned it automatically :) I love pad thai and can’t wait to try it! P.S. I feel bad for just now commenting on your site, I’ve been a follower for quite some time. I adore your posts! Ok so I won’t make this recipe because I am allergic to soy, sesame and peanuts, but I just wanted to say that I am so glad to know that other people get obsessed with meals! What a relief I thought I was nuts, wanting to eat the same thing over and over until I get sick of it and move on to something else. I love Pad Thai! This looks so yummy. Thanks for sharing. That’s a great idea. What sauce do you have on top of the meal? Now I have to put this recipe to my todo-list because I just yesterday followed your tip to make big batches of food. I made huge bowl of salad, salmon soup, chicken soup and lots of meatballs. Next few days will be really busy for me, but I’m still able to eat well! By the way, I would love to hear how your book project is going on! If I had to guess, I bet it was sriracha. Yum. The book is going great! In the final stages of editing the memoir now. I’ll consider a post about it! Love Pad Thai and love that this is the skinny version. Can’t wait to try it. Just pinned it. How many heads of cabbage do you think I need to buy for 6 cups? Will one do it, or should I spring for two? For me, six cups usually means half to three quarters of one big head of green cabbage. It’s a lot! I have a sun butter sauce on hand. You gave me an idea to use the cabbage, saute or grill up some chicken and top with the sun butter (like peanut) sauce! Thanks! Sun butter sauce sounds fantastic! Mmmmm, this looks delicious! I do love fried cabbage – especially in Asian cuisine. Have to try this soon. That looks so good! I never thought of subbing something like cabbage for noodles. I am not a huge cooked cabbage fan but I will definitely try this. Also thin strips of zucchini as noodles might be good too! Would it be OK to substitute canola/vegetable/olive oil instead of sesame oil? Thanks! I’m allergic to eggs and I honestly had no idea until I just read this that there were eggs in Pad Thai and that’s why it’s made me sick every time I’ve had it. Thanks for saving me! Clever, clever! Love the cabbage instead of pasta!! Andie – thank you so much for the Thai Red Curry Shrimp recipe! We haven’t even finished the first batch (I doubled it) and I’ve already been requested to make it again. We loved it! Thank you for sharing! My next venture will be this delicious looking pad thai! I’m buying peanuts and cilantro and making this tonight! I made this tonight for the husband and I because I was super craving Asian cuisine without the meat and it was oh so delicious! I added some sprouts for extra crunch and lots of Sriracha for a kick! Thanks so much for bringing this awesomeness into our lives! I’ve made a similar version with bean sprouts added. If you mix the oil with the soy sauce and sugar and leave everything raw, it makes a great salad on day one…leftovers wilt overnight in the fridge and the next day it makes a very awesome stirfry. The recipe I have uses sunflower seeds and green onion. oh…and leave out the eggs if you’re doing the salad! Can I leave the eggs out entirely or will that ruin it? Sure you can leave them out! The eggs aren’t necessary. Thanks for getting back to me! Love Love Love your blog! You have an amazing gift and I am grateful I stumbled across your blog, I am hooked! I made this and it is delicious. Thank you for sharing! YUM!!!! I cannot wait to try this! Great recipe! I have been wondering for a while now…. What are the essentials to keep in the freezer when you are focused on eating healthy and natural. I’ve noticed that most things that are kept in the freezer are the meals that you heat up with loads of preservatives. So I guess I’m wondering what you keep in your freezer? I think this is going to be my lunch for the next six months or so. Looks great!!! I get on streaks, too! Switching from avocado turkey rollups to this sounds good for my next streak. Making the same thing for lunch every day seems to help me with weight management. No temptation. I really, truly wanted to love this dish, but it came out very bland and I’m not sure where I went wrong. I skipped the sugar but stuck with the recipe otherwise. But I’d love to try it again. Can you recommend any spices or other ingredients to snazz it up a bit? I used sugar substitute instead of real sugar and it tasted great. The lime adds a nice flavor too. How about adding some peanut butter? Oh no! I’m sorry, Sarah. This is one of the bummers about recipe creation and testing, isn’t it? I would say to try upping the garlic, adding some minced fresh ginger (saute with the garlic), another drizzle of sesame oil, some red pepper flakes, or curry powder. I realize that these additions take the recipe away from being more pad-thai-tasting, but they’ll certainly add more flavor. Holy Christ! Just made this and added sprouts, lime, and some spicy siracha sauce and i’m in heaven!! Thank you! LOVE this recipe! It tastes so good! Have you ever added chicken? We just inhaled this for lunch. Light, tasty and definitely a keeper. Glad I bought enough cabbage to make this for another lunch tomorrow. Andie, all the recipes I’ve tried from your site have been a hit! I made this for the second time tonight. Great recipe!!! I add crunchy peanut butter instead of peanuts. It’s so, good and so filling. Thank you!!! I’m SO excited to try this. For those that are pad thai lovers, the key ingredients for the sauce are fish sauce, sugar, and tamarind in equal measure. The commercial versions often use lime juice in place of tamarind and/or soy sauce in place of fish sauce. But it’s basically sweet, salty and sour. So, if you add some life juice, you’ll be closer to authentic. Had to drop by and thank you for this recipe. I made it twice in 3 days time. It’s sooo yummy, economical, and health-savvy. Couldn’t ask for a better combo. I wanted to lighten up the meal after thanksgiving and this was it…I loved the favors..can’t imagine what is making the calories but it was terrific. Andie this was fantastic, I am loving your recipes! Thank you so much! I’ve been in a cooking rut, but I think this recipe got me out of it! I cannot believe how tasty this pad thai is! Already excited for lunch tomorrow! This is sooooo good. I’ve made it three nights in a row now. I can’t get enough! I made this for dinner tonight… DELICIOUS!!! Looks wonderful. I love Pad thai but not all the calories. Brilliant! I love that this sneaks veggies in with using loads of cabbage. I can’t wait to try this. 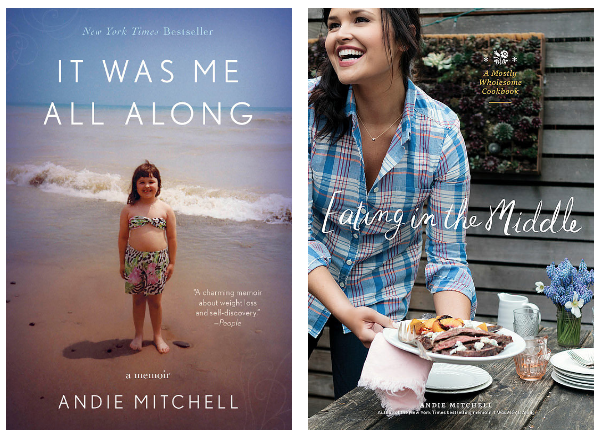 Andie, your story is amazing! Thank you for this recipe, I followed it exactly and def, the peanuts, cilantro, lime, and siracha (aka kickin chicken sauce) make it awesome. Will def put in our rotation!!!! I just found your blog and I have found it to be truly inspirational! Of course, I’m always finding weight loss blogs, and I just can not relate. They are slaves to it. I am like you in many ways. I passionately love to cook. And to eat! I will never give those things up. Seeing your blog is a great way to see someone succeed and eat the foods they still love (and is not a slave to the gym, either). Yay moderation! I just moved away from hometown, and also, my most favorite Thai restaurant. I made this tonight and totally got a healthy pad Thai fix. Thank you!! It’s excellent. OK, world longest blogger comment officially finished. Thanks! I have found I had to drain the cabbage before adding the final touches because the moisture from the mushrooms and cabbage tend to soak the mix. Did you come across this issue too? Making this right now! I will come back to let you know how it turns out! Made this and loved it! Added yellow onion and red pepper with the cabbage. Finished it off with a good squeeze of fresh lime juice. It was delicious and definitely a keeper! I did! Great idea to drain. Mine was a little mushy but still totally delicious. I made this last night and HOLY HELL was it delicious! I added pea pods and broccoli so it was closer to pad see eww (which is my all time fav). I will be making this again tonight. And maybe tomorrow. ive made something similar for a few years. its amazing!! and yes i have also eaten it for weeks straight…its the most versatile recipe i have ever tried!! examples: 1. use a little peanut butter 2. srirachi is a must 3. add chicken or beef or shrimp 4. add whatever veggies you crave that day. 5. add a little ginger. 6. add toasted sesame seeds 7. make it extra garlic/extra sweet/extra nutty/extra spicy depending on your mood. ! 8. borrow ideas from other thai/indian/oriental recipes and try to add them! Andie strikes again! Home run! I just made this tonight. It’s been sitting in my to-do pile since I got the email. Gotta move your recipes to the top. This dish was light and fresh tasting. Added siracha and it was indeed blissful. Thank you! Just wanted to drop a note to tell you how much my fiancé and I enjoyed this tonight!! We’re both trying to be a bit more healthy in preparation of our upcoming wedding – which is so very hard when you love food as much as we do! Thank you for providing so many delicious (and healthy) options for us!! This was very good and flavorful!! I ended up adding celery, carrot, onion and red pepper. Stir fried the veggies in a separate pan then threw them on the cabbage once it had all cooked down. Like everyone else said, adding lime, cilantro and sriracha is a must. Might as well use the rest of my cabbage and make this again tomorrow! I love cabbage. I think I will try this this weekend. Thanks for sharing! And I’m glad that I’m not the only one who make meals an excessive number of times in a row! I get totally stuck! Right now for breakfast I’m having the [one banana blended with two eggs] “panfakes” for breakfast. Every morning. And sometimes again for dessert. Oh, my. Thank you for this recipe. Pad Thai is a favourite of ours but we have stopped having it because we are trying to cut down on white carbs. The cabbage is a great alternative and we will surely start having Pad Thai more often. We added sweet chilli sauce because it is more traditional. Can’t wait to try the rest of your recipes. This is SO delicious! So I substituted a few things to make a tad less salty and it was still…amazing! Holy crow. Been reading/following forever and finally made this, with the addition of some fish sauce and dry sherry, as well as a squeeze of lime right at the end… this was incredible. I used pre shredded cabbage from the produce section of the store, it was Angel hair pasta fine and the finished dish consistency was spot on pad Thai. Made my mouth happy. Adding bean sprouts next time. Thanks Andie!! This is… amazing. It is SO filling too! I added sriracha too- and I imagine this would go super well with a beef or chicken (or a meat sub)—- I am constantly hungry- so thankful for a low cal option like this that REALLY fills you up. a+! Just wondering how this ends up with 20 grams of fat! Looks incredible but it can’t be from the one tablespoon of oil on the pan can it? thanks for the recipe. i made it tonight. it was incredible easy and tasted really good!